How do I make a Sauna on a Camping Trip? A camping trip sauna is one of the hottest things you can do (pun intended) but can also be very dangerous. I would not recommend trying this until you’ve seen it done a few times by an experienced guide, and are with someone who has done it before. 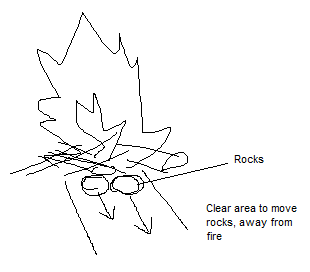 Basically, the premise is to cover an area with a tarp, and to bring in hot rocks that you can pour water on to create steam. Sounds simple enough, but it isn’t. The first thing you need to do is create the sauna area. There are a lot of ways to cover an area with a tarp, but for this you’ll need to make sure that the area underneath the tarp is big enough for you and your friends to sit under, without getting too close to the pile of burning hot rocks in the centre, and without the rocks getting too close to the tarp. As I mentioned before, super dangerous. If you do not have an extra-large tarp, it is advised that you use two and try your best to do so in a way that creates somewhat of a seal. If you do have a large tarp, hitch the middle to a line that you can pull over a tree branch. This will keep the center above the rocks from falling down. Prop up the sides with your bodies or with packs, and tuck the ends of the tarp under to keep them from moving in the wind. You should also remember to bring in some water, and to leave a “door” area where you can safely come and go. This is critical because you’ll soon be carrying burning hot rocks, and you’ll want to get in so that you can put them down before they burn through whatever you’re carrying them with and melt your hands. Did we mention that this whole idea is ridiculous? Once the tarp is set up (or while its being set up) make a fire and let it get nice and hot. Find some rocks about the size of large potatoes, clean them, and put them in the fire. You’ll want to create a space where you can slide them out once they’re hot in order to safely retrieve them. After the rocks have been sitting in the fire for some time (how much time will depend on the heat of the fire, but 10 minutes should be plenty) slide them out onto the clearing using a long stick. The rocks at this point will melt your skin if you touch them, so make sure not to let them roll away into anything flammable. When the rocks are far enough away from the fire to be safely retrieved, roll or slide them onto a grill that you can use to carry them into the sauna. Make sure they won’t roll off, and if they do, make sure they don’t roll off onto you or anything flammable. It may even be worth bending the grill to keep them stable. Once under the tarp, place the rocks in the center, leaving a good distance between them and anything else. Close the door, pour on the water, and enjoy your extraordinarily dangerous homemade sauna! Seriously, though, don’t actually try this. Older PostWhich Evergreen is my Christmas Tree?